Here are important Pipe and Cistern questions and answers for SSC and bank exams. 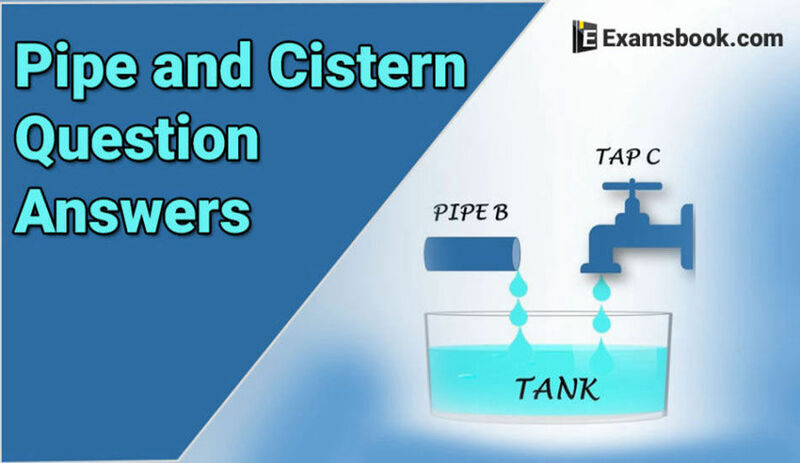 These Pipe and Cistern questions have been asked in competitive exams and there are chances to ask again in other competitive exams. Practice with these selective Pipe and Cistern questions and answers. Let's start solving yourself Pipe and Cistern questions with answers for better results. To know how to solve these questions, you can visit Pipes and Cisterns Formula for competitive exams. 1. A Cistern can be filled by a tap in 4 hours while it can be emptied by another tap in 9 hours. If both the taps are opened simultaneously then after how much time will the cistern get filled? 2. A tap can fill a tank in 6 hours. After the tank is filled, three more similar taps are opened. What is the total time taken to fill the tank completely? 3. A water tank is two-fifth full. Pipe A can fill a tank in 10 minutes and pipe B can empty it in 6 minutes. If both the pipes are open, how long will it take to empty or fill the tank completely? 4. Pipe A can fill a tank in 5 hours, pipe B in 10 hours and pipe C in 30 hours. If all the pipes are open, in how many hours will the tank be filled? 6. Two pipes A and B can separately fill a cistern in 60 minutes and 75 minutes respectively. There is a third pipe in the bottom of the cistern to empty it. If all the tree pipes are simultaneously opened, then the cistern is full in 50 minutes. In how much time the third pipe alone can empty the cistern? If you face any problems while solving Pipe and Cistern questions, ask me in the comment section. Visit next page for more Pipe and Cistern problems.